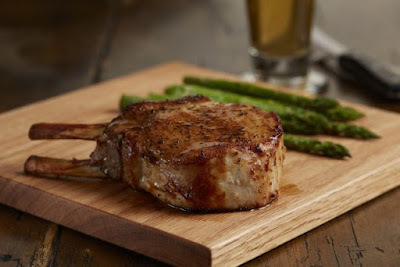 BJ's debuts a new "Brewhouse Slow-Roasted" menu featuring new, slow-roasted meats that are prepared in limited quantities each day. Each item is roasted for as long as eight hours and is hand-carved to order. According to the chain, they used "state-of-the-art" ovens that "maintain exact temperatures to ensure every piece of beef, poultry and pork is browned on the outside and tender and juicy throughout." - Prime Rib - 15 oz. slow-roasted prime rib, au jus, creamy horseradish, choice of two sides, choice of soup or salad, and choice of Pizookie. - Double Bone-in Pork Chop - Slow-roasted pork chop, Big Poppa Smokers' Sweet Money Championship Rub, and choice of two sides. - Baby Back Pork Ribs - Slow-roasted baby back ribs, Big Poppa Smokers' Sweet Money Championship Rub, BJ's Peppered BBQ sauce, and choice of two sides. - Classic Prime Rib Dip - Sliced, slow-roasted prime rib on a hoagie roll with au jus, creamy horseradish, and fries. - Hand-pulled Turkey Dip - Slow-roasted herb turkey breast, Swiss cheese, and caramelized onions on a hoagie roll with au jus, horseradish aioli, and fries. - Barbecue Pulled Pork - Hand-pulled slow-roasted pork shoulder, BJ's Peppered BBQ sauce, crispy onion strings, and creamy BBQ ranch dressing on a toasted Parker House bun with BJ's signature coleslaw and fries.